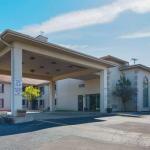 Offering free WiFi Motel 6 Hannibal Mo is located in Hannibal. This 2-star hotel offers a 24-hour front desk. Guests can chill out in the indoor pool. All guest rooms in the hotel are fitted with a TV. The rooms are equipped with a private bathroom.